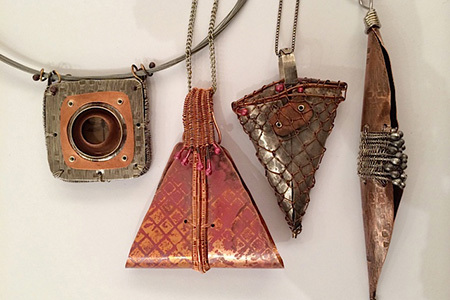 Participants in this class will learn to make a variety of unique surfaces using patinas, embossing, colored pencils, torch fire enameling, and more to create distinctive jewelry. Many enamel torching techniques will be covered, such as adding glass beads, silver foil, resists, sifting, over torching, using rubber stamps, and adding patinas. A variety of cold connections and weaving techniques will be used instead of soldering to connect and create the pieces. Participants will use copper, brass and silver sheeting, sheet metal, and a variety of found objects to construct their pieces. Participants are encouraged to bring their budding ideas as well as small personal found objects to discover the endless options for assembling and connecting. The goal is to find unique designs and approaches and use personal expression to create one's own jewelry, and participants will learn new and alternative approaches to both surface and construction. I truly love what I do, both in my Artwork and in my personal life. I have a passion for life itself and try to portray that feeling in all my Artwork. Each piece of my work is used as a reference for the next; building upon the successes, then improving and refining. My work is currently going through a state of transition. This is an exciting and fulfilling time in my career as an artist, one of exploration and creativity in which I am discovering new directions in my work. I find my inspiration from everything that grows, whether in Nature, Relationships, or Life itself. Change is the fuel for my creative spirit. Mary Hettmansperger is the owner of Gallery 64 in Wabash, Indiana. Mary has taught in Australia, New Zealand, Ireland, the UK, and Singapore internationally, and at Arrowmont, Penland, Bead and Button, Convergence, National and Regional Fiber conferences, Art and Craft Schools, and private Guilds across the US for 30 years. Mary has authored and illustrated 4 books: Fabulous Woven Jewelry; Wrap, Stitch, Fold and Rivet; Mixed Metal Jewelry Workshop; and Heat, Color, Set and Fire, all published by Lark/Sterling. She has also produced 3 DVD’s for Interweave on surface design and jewelry. Other books that have featured Mary’s work include Jewelry Design Challenge, 500 Baskets, Fiber Arts Design Book 7, The Gourd Book, Creative Scarecrows, Pushing the Envelope, Fabulous Found Object Jewelry, Teapots: Makers and Collectors, Beading with Crystals, and Creative Beading Volume 2. Mary has had work exhibited at private galleries, SOFA, and invitational exhibits. She does segments for PBS programming, on-line workshops, and you-tube segments – with Beads Baubles & Jewels, and with Quilting Art – and has had her work published in many magazines, including Quilting Arts, Art Jewelry, Bead and Button, Beadwork, Shuttle Spindle and Dye Pot, and Crafts Report. Copper Wire (28, 22, 20, 18, 16) just a few varieties.